All right, readers, time to test your knowledge of Chicago politics. There are two marinas on the Calumet River on the far southeast side of the city. One's owned by a consortium of well-connected investors, including a Bridgeport insider who's donated to politicians all over town and owns a trucking company that was paid tens of thousands of dollars in Mayor Daley's scandal-plagued Hired Truck Program before the program was phased out in 2005. The other marina is owned by a former truck driver who only recently realized it might be a good idea to contribute to his alderman. So guess which marina the city wants to force to close up and sell out as part of a $25 million redevelopment plan financed by taxpayers? You guessed it: the one owned by the guy with no clout. "I'm getting screwed," says Mike Olsen. "Big time." Now a new TIF district, called the Calumet River TIF, has been proposed for the area that runs roughly from 134th Street south to 138th and from Torrence Avenue west to the Bishop Ford Expressway. At the moment, much of the land in the proposed district is either vacant or underdeveloped; a big chunk of it is an old Waste Management landfill. Under a city proposal, the TIF would fund up to $25 million in infrastructure and improvements, including a brand-new marina. But there are already two thriving marinas there just south of 136th: Olsen's M&M Windjammer, which he co-owns with John Jane, a machinist, and Sunset Bay Marina, owned by Sunset Bay Marina LLC, a limited liability company whose three principals, according to paperwork filed with the Illinois Secretary of State, are businessmen William Pacella, George Bonomo, and Shadow Mirkhaef. Pacella owns Pacella Trucking Express, at 2558 S. Damen, which according to a Sun-Times investigation in 2005 received about $50,000 from the city for trucking work. Pacella was an investor in Crown Casino Corp., a gaming business that, as the Sun-Times reported, tried unsuccessfully in the 1990s to acquire a riverboat casino license in Illinois; among the other investors in that company was Fred Barbara. 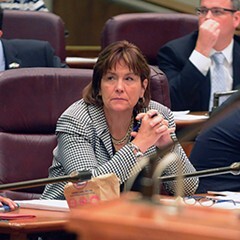 (Barbara's a friend of Mayor Daley's whose grandfather, Bruno Roti Sr., was identified as a mob boss by federal authorities and whose uncle, former First Ward alderman Fred Roti, was convicted of racketeering.) According to a bio posted on the Web site of the National Thoroughbred Racing Association, Pacella, Barbara, and Bonomo grew up together in Bridgeport and have teamed up to own racehorses. Over the last ten years, according to the Illinois State Board of Elections, Pacella and his businesses have donated thousands of dollars to powerful local politicians, including Mayor Daley (at least $1,000), his county commissioner brother John and the 11th Ward organization he runs ($4,550), county board president Todd Stroger and his Eighth Ward organization ($700), state treasurer and U.S. Senate candidate Alexi Giannoulias ($6,000), alderman John Pope, whose Tenth Ward includes the marinas ($1,000), and alderman Ed Burke, chairman of the City Council's finance committee, which signs off on ordinances creating new TIFs or authorizing the use of TIF money for private development ($4,600). 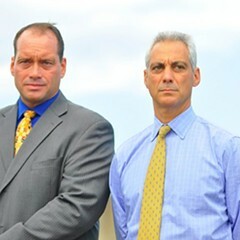 Bonomo and Sunset Bay have also pitched in for Pope, and last year the alderman held a fund-raiser at that marina. Pacella, Bonomo, and Mirkhaef are relatively recent entrants on the Tenth Ward marina scene. This stretch of the Calumet River is popular with boaters who live on the southeast side or in the south suburbs, and throughout the 80s and 90s there were three marinas serving them, each with its own bar. In 2000 Olsen and Jane took out a mortgage of $235,000 and bought the M&M Windjammer Marina. In 2006 Pacella and his partners took out two mortgages for $5.2 million, bought the other two marinas, including Sunset, and put up a new concrete boat storage facility. Olsen says they also made an offer on his property. "I turned them down because I thought it was insulting," he says. Olsen's marina has 24 slips and a hopping if careworn bar. "We may not be pretty, but our customers like us," says Olsen. "We're open all year round. We're kind of a working-class business. Most of our customers are working-class guys." City planners proposed creating the new TIF district and marina in 2008. Their first step was hiring the Saint Louis firm PGAV Urban Consulting to write a report establishing why the area is eligible to be turned into a TIF district. "I saw these guys coming around, but I didn't know what they were doing," says Olsen. "I didn't know a TIF was coming—no one told me. I said to them, 'You need help?' They said no. I figured they were with the city or something." Under state law, an area has to meet certain broad criteria to be eligible for designation as a TIF district. It might have buildings that are more than 35 years old or landowners who are behind in their taxes. There might be plenty of land available for development but little interest from developers. 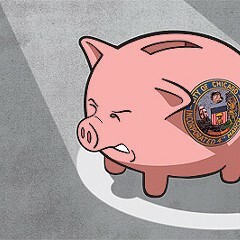 But the law has so many loopholes that virtually every corner of Chicago, including the financial district, qualifies. In this case, it's a slam dunk—there are acres of vacant land and abandoned industrial property. The PGAV report, which was released on October 13, hammers away at the Windjammer property. 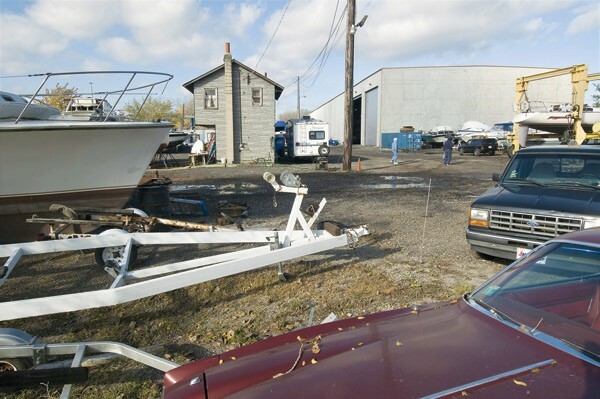 "A considerable portion of the vacant land in the Area would require significant clean-up of junk and debris, removal of abandoned boats, deteriorated semi-trailers, shipping containers and inoperable vehicles prior to development." The report has a much more benign view of Sunset Marina, noting that its owner increased the property's value by constructing the new storage building. It recommends that the city use TIF funds to buy Windjammer and make the property part of a larger marina operation. The report does not recommend that the city buy Sunset. Olsen's operation is a bit untidy. Some of the boat sheds are sagging and in need of a paint job. 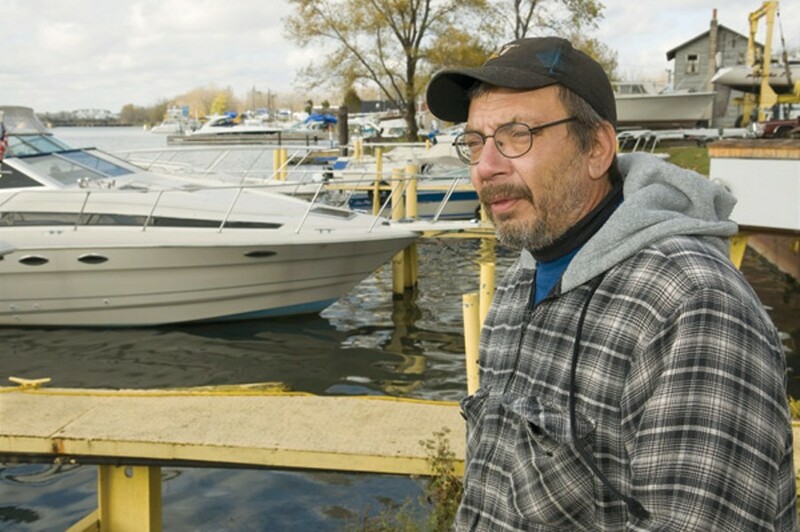 The city has ticketed him in the past for accumulating excess debris on the property—behind the bar are piles of wood, old cars he's storing for friends, and boats he stores for the winter. The marina is well off the main drag, Torrence, and only accessible by dirt roads that are rarely used by anyone but boaters. But as Olsen sees it, "The city's using its power to take my business and give it to someone else." The TIF report doesn't specify who would develop Olsen's property once the city purchased it—and it's just a proposal. Alderman Pope, who supports the TIF, said that at the moment the city doesn't have plans to acquire Olsen's land. "The TIF is part of general plans to develop the area," he said. "There are no specific projects in mind. We're exploring options. This gives us more options." "The foremost purpose of the Cal River TIF would be to help finance the public infrastructure that the marinas currently lack, such as paved streets with curbs, gutters, and lighting," says Peter Strazzabosco, a spokesman for the city's Department of Zoning and Land Use Planning. He says the city placed Windjammer on an "acquisition list" of properties in the TIF district—meaning those it might move to seize by eminent domain—because "it doesn't appear that the owner is doing anything to improve his property." But Strazzabosco says that doesn't mean the city has made any final plans. "There is no immediate intent for the city to acquire specific parcels, and no pending marina redevelopment proposals involving TIF assistance." Sunset Marina's owners are mostly staying quiet. Pacella didn't return my calls, and Mirkhaef referred me to Bonomo. Bonomo told me he didn't know anything about why the TIF was being created or what was planned for Olsen's property. "You know more about it than I do," he said. "I'm learning more from you than I knew." Olsen also says he met with Pope on October 14 at the alderman's ward office. "He told me there was no plans for the area, and if they were going to take my property they'd give me a viable price," says Olsen. "He said it would be above fair market value, which I don't believe." Olsen is probably wise to be wary. The report doesn't float the idea of getting Pacella and his partners to sell. The Community Development Commission and the City Council would have to approve the proposed TIF district and a new marina, if that ends up being in the final plans. But since these bodies rarely, if ever, vote against a TIF proposal, the deal could sail through next year. Which means that sometime within the next year or so, lawyers for the city could very well offer Olsen something for his property. If he turns it down, they'll take him to court to seize it under eminent domain law. There are plenty of reasons to object to the way Mayor Daley uses his TIF program. But this little proposal exposes one of the more egregious problems with it: its arbitrariness. The city appears to be preparing to use property-tax dollars, and its eminent domain authority, to drive a flourishing if funky-looking business out of business—all in the name of economic development. The city has the legal right to seize Olsen's property, or anyone else's, as long as it makes a compelling case that the larger public good is being served. But what larger public good would be served by spending millions of desperately needed tax dollars creating a marina monopoly on the Calumet River? It certainly won't help boaters in the area who'll have one less alternative to choose from when they shop around for the best site to dock. There won't be any tax advantages—just the opposite. Once the TIF is created the property tax paid by whatever new business goes in there will be diverted to the TIF fund for the next 24 years. That means it will be two decades before the schools and parks can even start to collect property tax dollars from the TIF district. For what it's worth, a spirited group of local environmentalists, the Southeast Environmental Task Force, says they intend to battle the plan. "We're concerned about the impact of building a new marina on the environment," says Peggy Salazar, the group's president. "We don't want a major construction project damaging to this area." Care to comment? 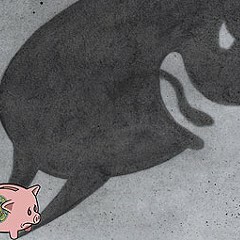 Find this story at chicagoreader.com. And for more on local politics, see our blog. Ben Joravsky discusses his column weekly with Dave Glowacz at mrradio.org/theworks.